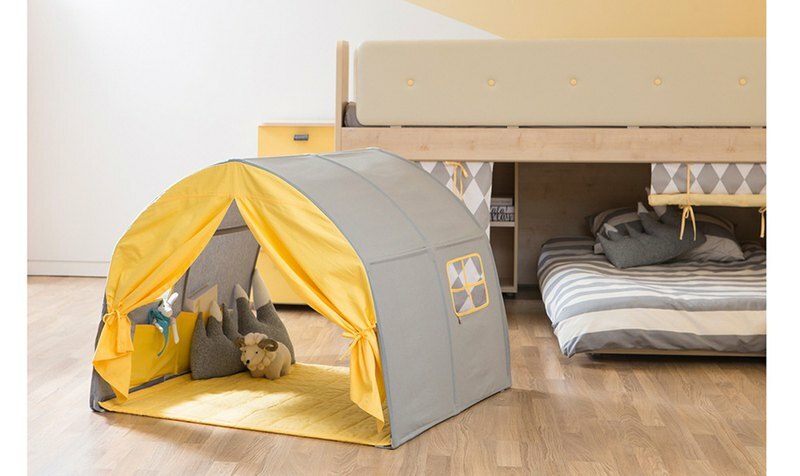 [iloom Yilun home] children's play tent (gray yellow) Intimate reminder: ※If the goods are: the original tag is cut, assembled, used, or disassembled, resulting in lack of integrity and loss of resale value, you can not return (exchange)! **Secret base for children's games** The simple assembled Cabin tent can be placed not only on the Cabin bed frame but also in any space in the children's room. Create a secret space and take it out when you go out for a picnic. The upper layer of the combination bracket can be hidden by the seam devil staining tape, and the lower layer cushion can increase the comfort of lying. The whole cloth can be machine washed. *iloom insists on the details, just like the mother's meticulous love, protect your favorite baby. https://c1.staticflickr.com/5/4908/46120886164_c17d3cd9ed_o.jpg Intimate reminder: ※If the goods are: the original tag is cut, assembled, used, or disassembled, resulting in lack of integrity and loss of resale value, you can not return (exchange)!